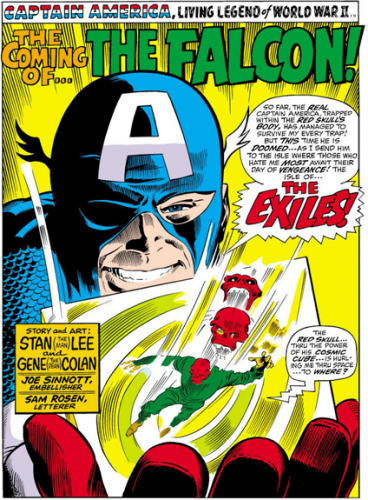 Welcome back to The Dollar Box, a monthly look at comics with an original cover price of a dollar or less. 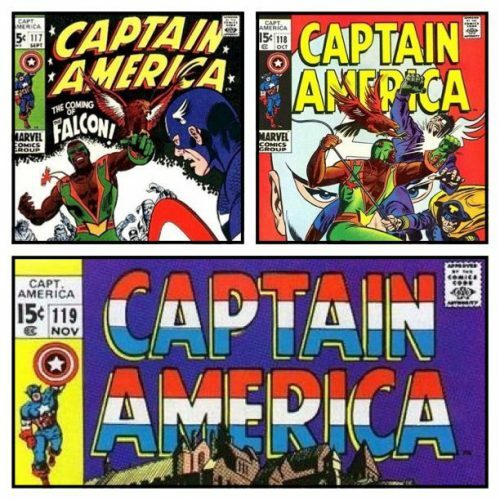 This month I break format to review not one but three comics … and unlike my previous topics, these aren’t exactly classic comics. In fact, they’re more like something you’d read about in a StashMyComics Say What?! column. 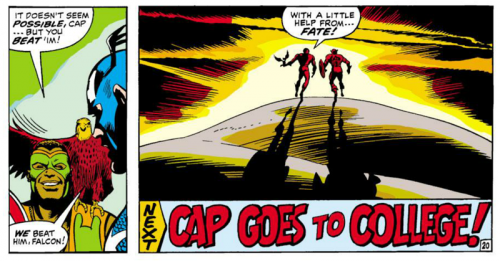 With his training montage complete, the Falcon and Cap/Skull win their return engagement with the still hopelessly-lame Exiles. Stan trance-channels his Sgt. 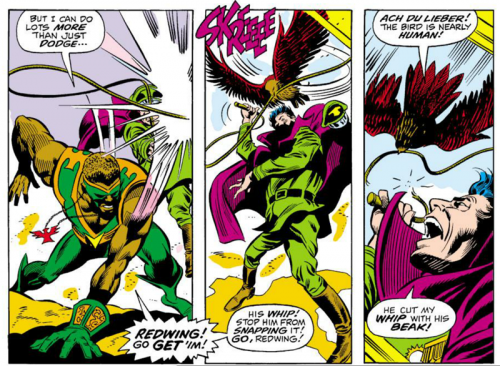 Fury days by busting out an “Ach Du Lieber!” so you know it is ON! Thanks for reading The Dollar Box! I’ll be back next month with another comic book treasure from the past. 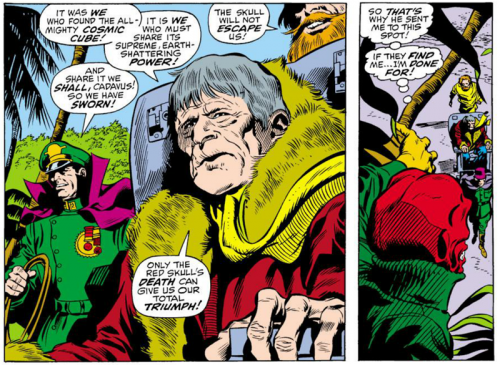 Thanks, as always, to StashMyComics for hosting this column, and please come and visit me at my home blog — Longbox Graveyard — where there’s a new comic book column every Wednesday! Nice review, and very funny! 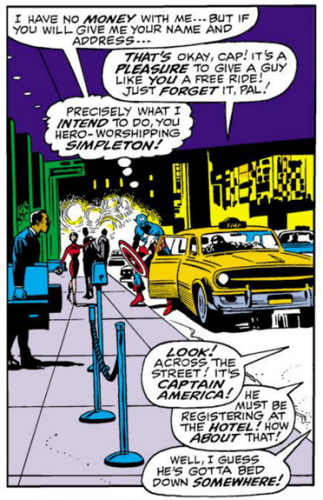 And here, I thought Marvel had started writing comics for adults by 1969. 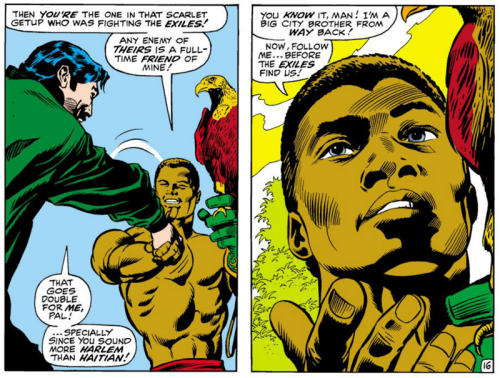 You’re right, Marvel’s first African-American superhero deserved a better (much better) origin. 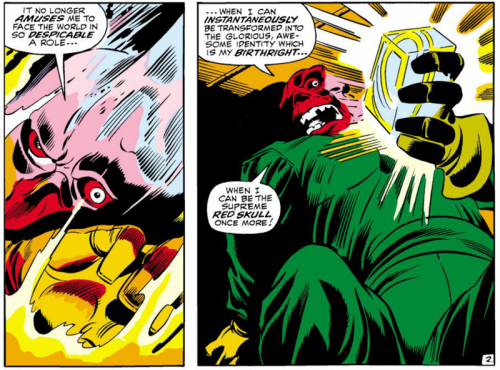 The art looks great though, and I have to say, the panel with Cap/Red Skrull laughing evilly and saying “what a magnificent stroke of sheer genius on my part” is one of the greatest panels in comic history. 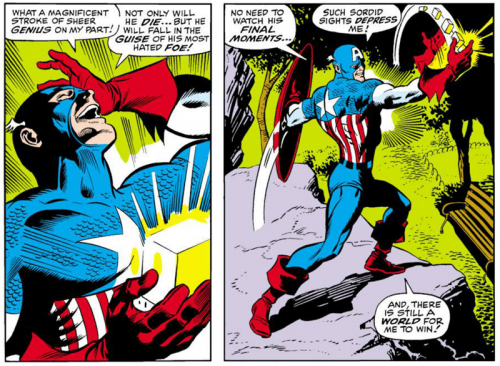 The look of malevolent joy on Cap’s face is priceless, and the words in that balloon match it perfectly. Thanks for reading and commenting, Dave. 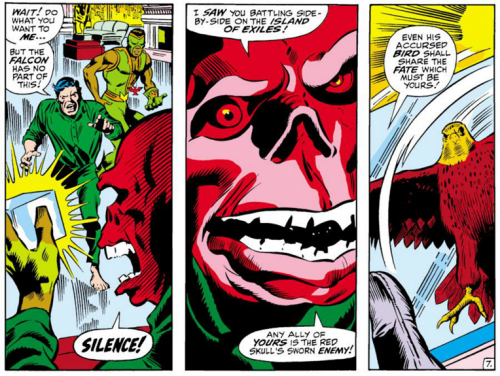 The Red Skull makes everything better. 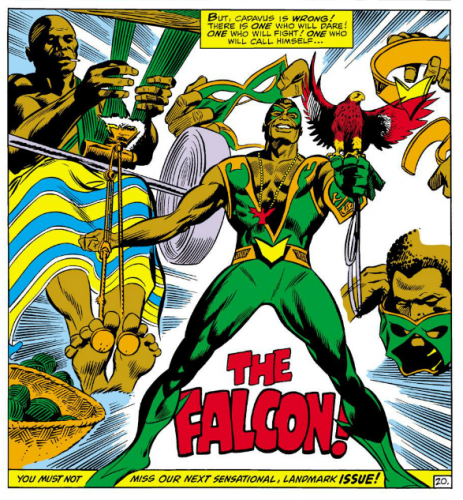 Will be interesting to see how much of this origin makes it onto the screen in the next Captain America movie, where Anthony Mackie has been cast as the Falcon. I’m betting on … zero percent? Or can I go negative? 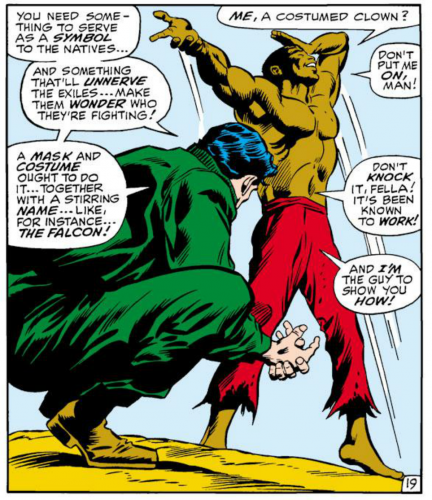 That’s a great out of context panel with Falcon lounging on the bed as Cap puts on (or takes off) his shirt, having said in the previous panel “You’ve all the equipment you need.” The internets live for that kind of thing! 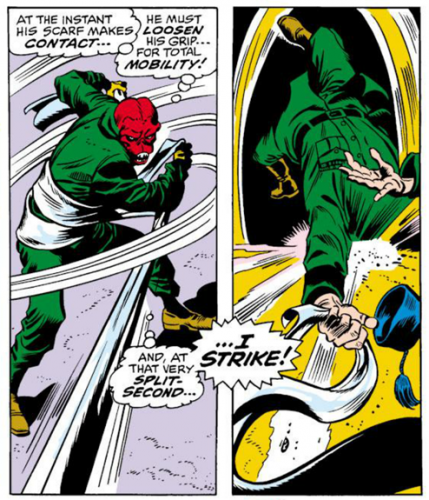 What I love about this arc, aside from the utter mundane-ness of the Red Skull’s human interactions is that there’s a lack of urgency on Cap’s part – he’s in the Red Skull’s body, the Red Skull is roaming around the city pretending to be Cap (and skipping out of cab fare and probably dine-and-dashing, too) and yet Cap’s got time to meet a new guy, get him all suited up to fight crime and then train him. 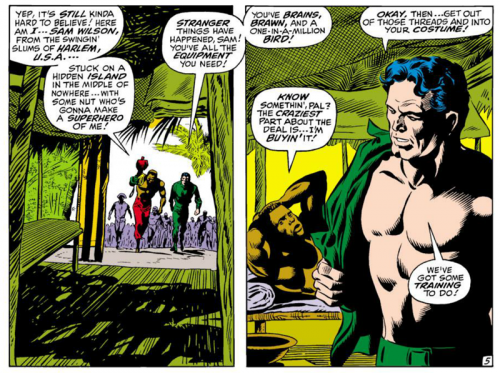 Really nice art by Colan, though. 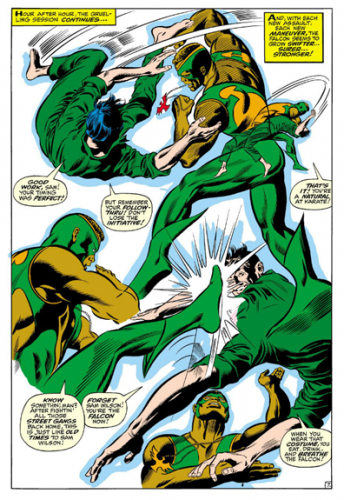 Gene Colan makes everything better.